On the day that O’Brien’s producers realized that Tarja Halonen was up for re-election, they contacted Ulla Suokko, a Finnish musician and performer living in New York, and asked her if she had time to tape a skit for the show that same night. Another taping took place on December 19th. One skit featured O’Brien and Ulla as a Finnish couple who admire Halonen for, among other reasons, reducing the murder rate in Finland from 2 every 10 years to 1, and because “Under Tarja our fisheries are producing more carp than usual”. A second skit featured them (and Tuomas Hiltunen) ice fishing and praising Tarja. 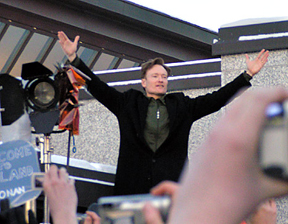 Halonen won the election, and Conan claimed credit for the win. On February 10th, Conan and his crew flew off to Finland to celebrate, and to visit with President Tarja Halonen. At one point Ulla suggested to me that since Conan is an excellent guitar player, perhaps he should also have a kantele. A few days later I (Gerry Henkel) made and shipped a "Konantele" to her to deliver to Conan. In my kantele shop, I carved and painted a caricature of him on the peg end of a 5 stringer. Below are two photos of Konantele - one showing his regular every-day self, the other his New York "night-life" neon self.